Thanks to gCensus, loading demographic information into Google Earth is a relatively simple process. You can produce a Google Earth KML file to visualize demographic and socioeconomic data from the 2000 U.S. Census -- in some cases down to the census block level. Let's say you want to pinpoint areas in Green Bay, WI for a door-to-door Latino voter registration drive. According to the 2000 census, there were over 7,000 Latinos in Green Bay. (The Census Bureau estimates that the Latino population has grown to 10,000 in 2007). We know from the block-group level Wisconsin interactive GOTV map that neighborhoods east of the river have significant concentrations of Latinos. Click here to use the interactive map zoomed to the focus area shown in the graphic below. Areas shaded orange are 20% to 40% Latino. The FairVote2020 interactive map shows detail only to the block group level (encompassing several city blocks), so the block-level detail available from gCensus can help focus the voter registration effort. 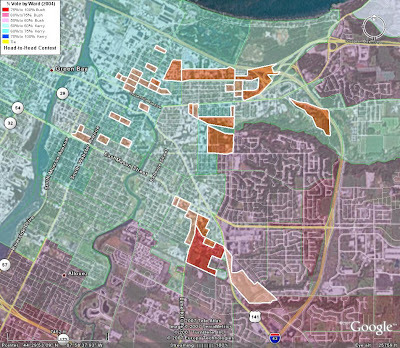 Below is a Google Earth graphic showing more detailed block-level data -- highlighting all census blocks in Green Bay with more than 31 persons who are Latino. These blocks are shaded tan to orange with white boundaries. The map dataset was created from Summary File 1 using the gCensus web form found here. 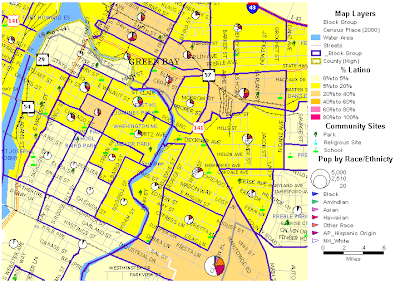 Click here to download the Green Bay Latino KMZ block file -- edited from the original gCensus KML file. The gCensus dataset expresses block population counts as a range, rather than a discrete count. As part of the editing process, we eliminated all but the top three ranges. In a future post, we will examine an obvious issue -- citizenship status. According to the 2006 American Community Survey, just one-third of the 6,700 Latinos of voting age in Green Bay are citizens. Note that in order to overlay census blocks on top of the Brown County Bush-Kerry precinct map as in the map above, we changed the altitude settings of the block file to begin displaying at 8 meters. Because we are focusing on just a couple dozen census blocks, the KMZ file imports into Google Maps with ease. For starters, these blocks are the best areas to begin door-knocking in search of new Latino voters.